LOS ANGELES (AP) — Clayton Kershaw put his previous flop behind him and pushed the Los Angeles Dodgers forward — one victory from a return trip to the World Series. “I don’t really think about the one before. 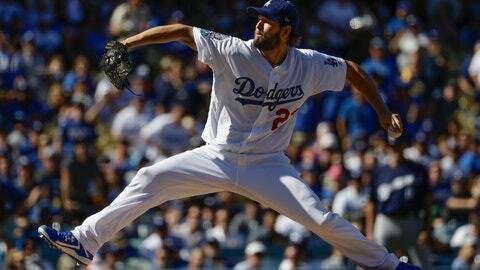 And after this one I’m not going to think about this one, either,” Kershaw said. Roughed up in the NLCS opener, Kershaw mixed his fastball and slider on a hot day to shut down the Brewers. The Dodgers ace didn’t allow a baserunner past the third inning. If the Brewers rally to win the series and this ends up being Kershaw’s last start for the Dodgers, he left behind a gem. The left-hander can opt out of the last two years and $70 million remaining on his contract after the World Series and become a free agent. He said Tuesday he hasn’t made a decision about his future. “The little things played a big part,” Roberts said. The Dodgers tied the game 1-all on Austin Barnes‘ RBI single up the middle in the fifth. Chris Taylor singled leading off, took second on shortstop Orlando Arcia’s throwing error and stole third. “It was huge to get there to third base, less than two outs, give us a shot to do some things,” Barnes said of Taylor. “It’s just a classic case of he executed a lot of pitches,” Counsell said.